The concept of a reformation among nations is prophetically alive and well in heaven, but bringing it to earth and connecting the dots between my own life and company and Kingdom is the challenge of the hour. It’s one thing to experience the presence of God at church or a conference; another to taste the same at work. Challenge – Large corporations have a mountain of polices, systems and procedures that tend to cause people to lose the simplicity of Kingdom and the purity of purpose. People can easily feel unheard, unknown, unappreciated and untapped. It’s hard for young engineers to adjust their college expectations of professional life to the realities of work in a bureaucracy. Our attrition rate is too high. Maintaining all the procedures and integration of competing systems consumes every manager’s time, and there is no credible attempt to manage the culture. The environment can tend to frustrate the creative, industrious types (the lions) and leave the plodding servants (the oxen) to man the ship. At some level we self-select oxen for our staff and managers who have never connected with their own purpose, and who become more and more cynical as they age. The mentoring program for most institutions, like schools, corporations and churches, produces oxen. What’s missing? – The immediate goal of every manager and employee is to “control” employees, systems and equipment, in order to produce a consistent, quality product or service. People end up being treated just like the procedures and machines that produce the widgets; we fix or fire them, after they break! Leadership that connects with and inspires hearts is the missing ingredient. It feels distinctly different from “management” in that the context for the corporate mission is its purpose. The corporation has a kingdom purpose and so do each of the people. The goal of leadership is always to understand the “why” that God wrote in the hearts of individuals and the company and connect the dots between the two. The very first distinctive of leadership is listening for purpose. Here’s where a prophetic gift is golden. Our job is to “hear” the desire God wrote in the hearts of people. 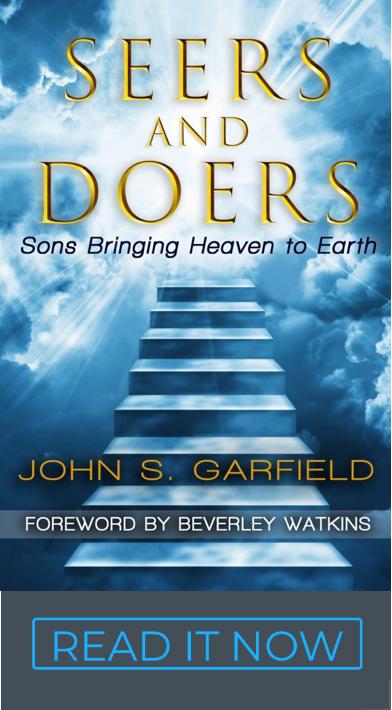 The secret sauce is that God has pre-arranged a connection between the corporate purpose and the desires he wrote in the hearts of His people. If we can take that one step of faith to believe purpose is present, it’s not that hard to discern it when we hear it. Being present – The first trademark is authenticity. Leaders are present in the moment and aren’t afraid of their own vulnerability. Their failures are right next to their successes in a way that encourages everyone else to drop their own pretense. It’s a cultural shift that allows hearts to come out of hiding and shifts the atmosphere from competition to cooperation. Good leaders make you feel safe and create space for you to talk. Specifically, they are listening for Kingdom purpose in the narrative of co-workers (our book) so they can release personal initiative and creativity that is consistent with corporate purpose (key to corporate profits btw). Shame – Wholehearted people have a healthy reconciliation with their personal vulnerability. Leaders leverage their own vulnerability to love people out of shame and into a sense of being included in a higher purpose already resident in their own hearts. They give people the reasons why they are worthy of being on the team. Greatness starts when being myself is good enough. Whether people are saved or unsaved, we are cooperating with what the Father wrote in their hearts and connecting them with their own, unique hearts (key to motivation btw). Note, the contrast from managers who are thought to be those who grade us, reprimand us and fire us. Telling stories – Leaders tell stories because the language of hearts is pictures. They intentionally limit feeding data to intellects and maximize painting pictures that connect with hearts. Their stories are parables that put the corporate “why” on display in a way that hearts can find a handle. Leaders intentionally communicate prophetic themes that resonate with hearts. Their leadership is intentionally connecting us with what the Father is doing in the Kingdom through our own corporation. I call it prophetic marketing; a trumpet that hearts can hear! Knowing what’s in the hearts of those around you is an essential ingredient of a healthy work culture. When it happens, people feel respected and loved, and the dynamic that results is very powerful. Instead of implementing this through a procedure or a system, let’s make it a contagious lifestyle. “What’s your dream? 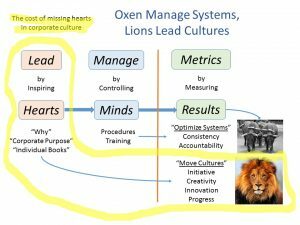 How can I help you take the next step?” A team of people with synergism for the same dream and goals can make work fun and fulfilling … and convert bored, unimaginative oxen into creative, industrious lion Kings.